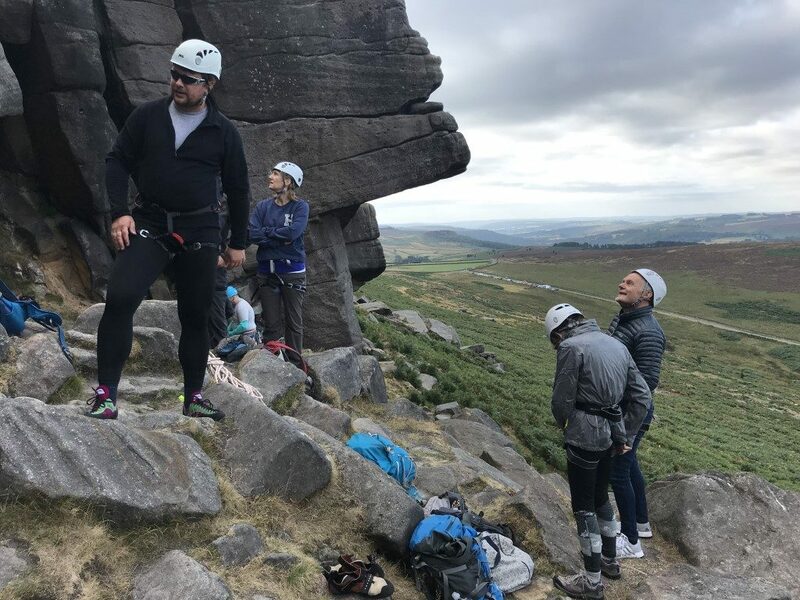 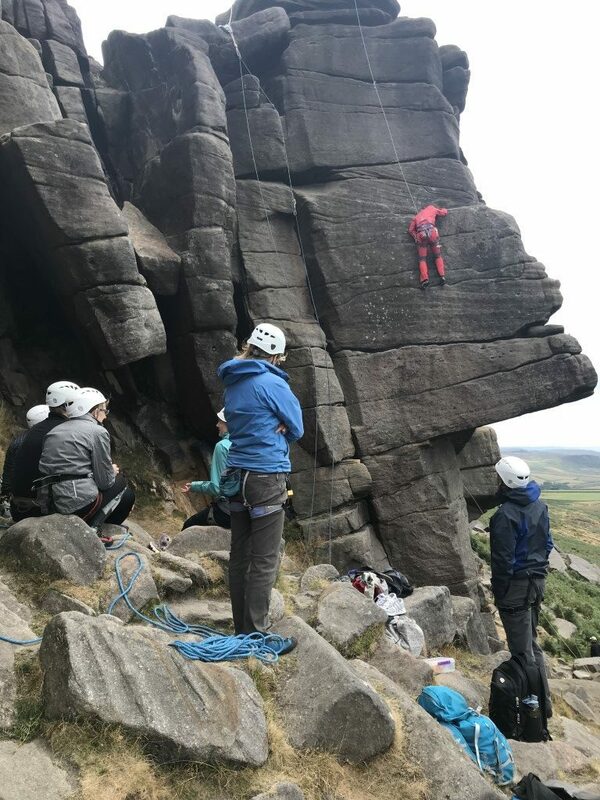 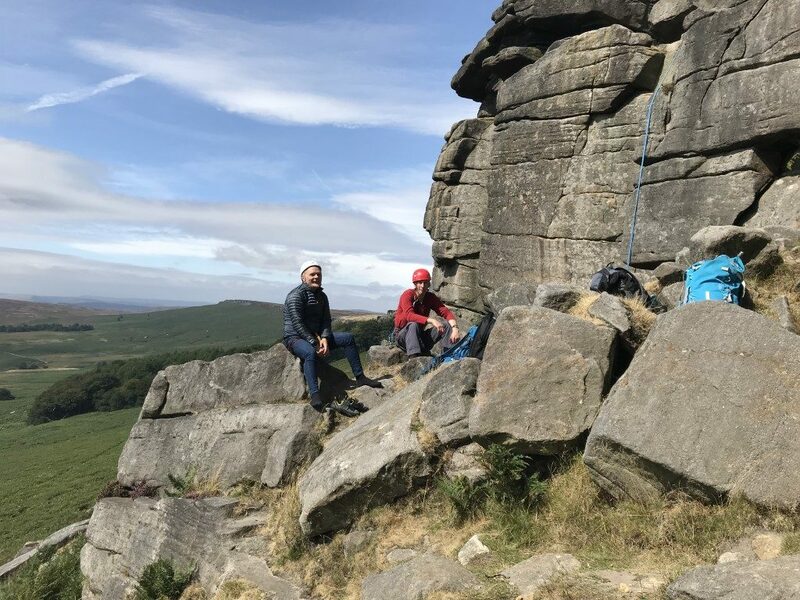 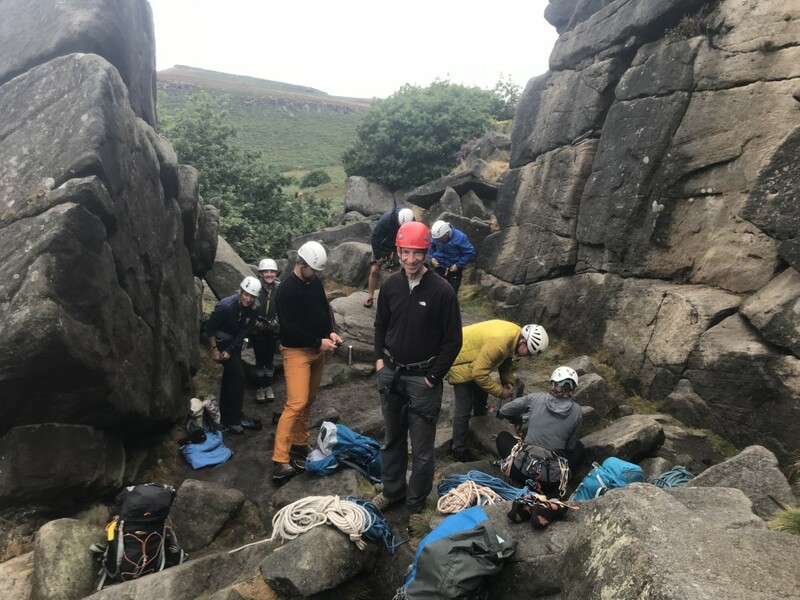 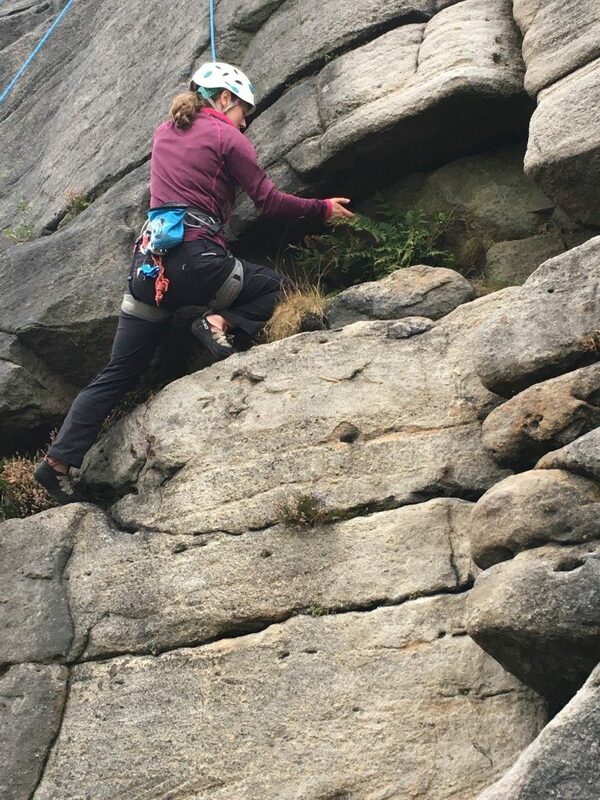 Although we are a mountaineering club there are many in the club with little or no climbing experience so there was a high level of interest in learning climbing skills. 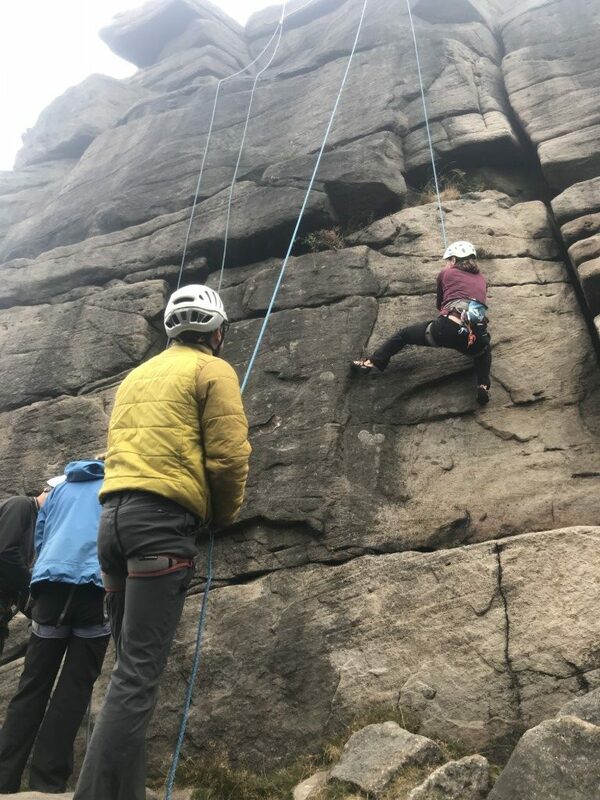 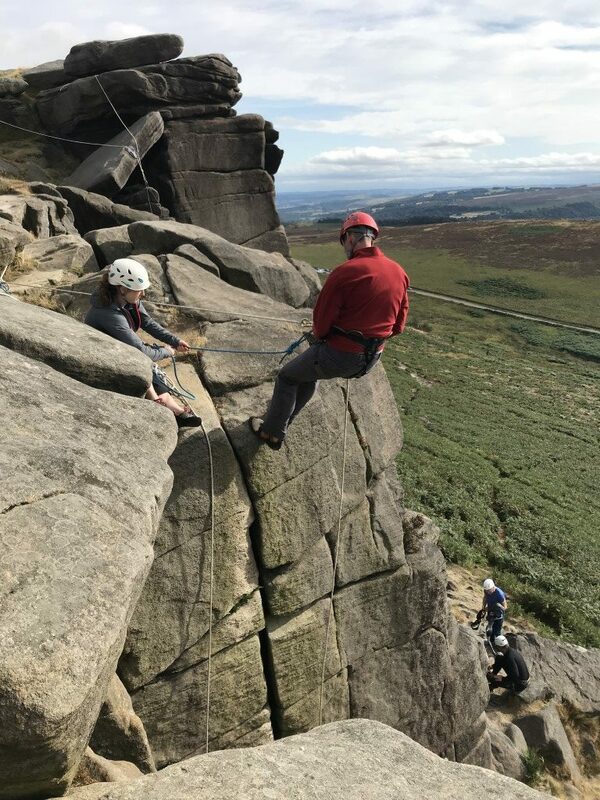 For this course we enlisted the help of Danny and Anita from ukmountainleader.co.uk who were fabulous instructors for the weekend. 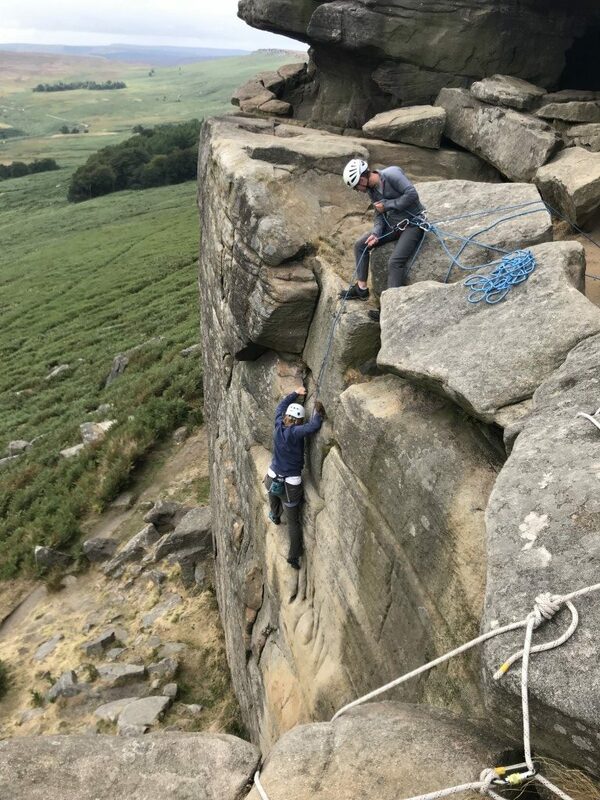 We stayed in Hope Valley (a mix of Pub or camping) and on Saturday morning made our way over to Stange Edge which is a mecca for climbers in the area. 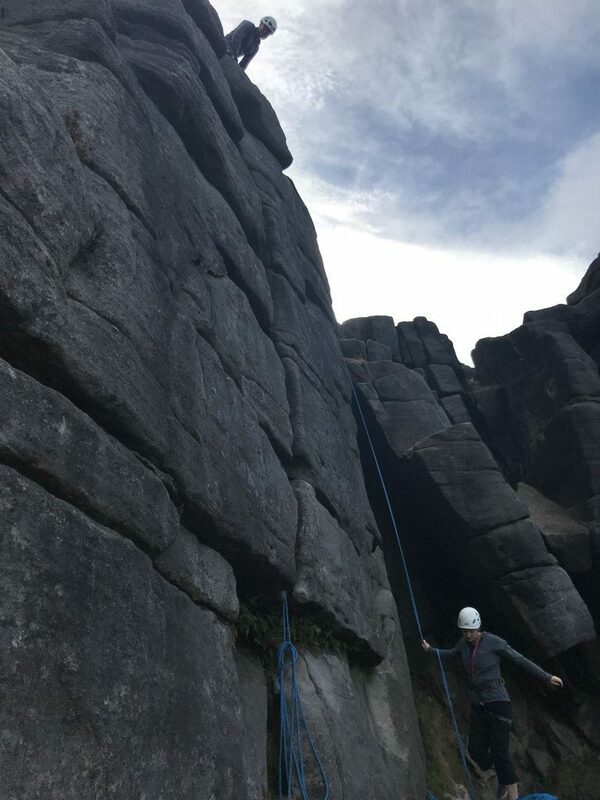 It wasn’t quite as busy as expected possibly due to the holiday season so Danny raced up the crags to setup the ropes and soon we were under way. 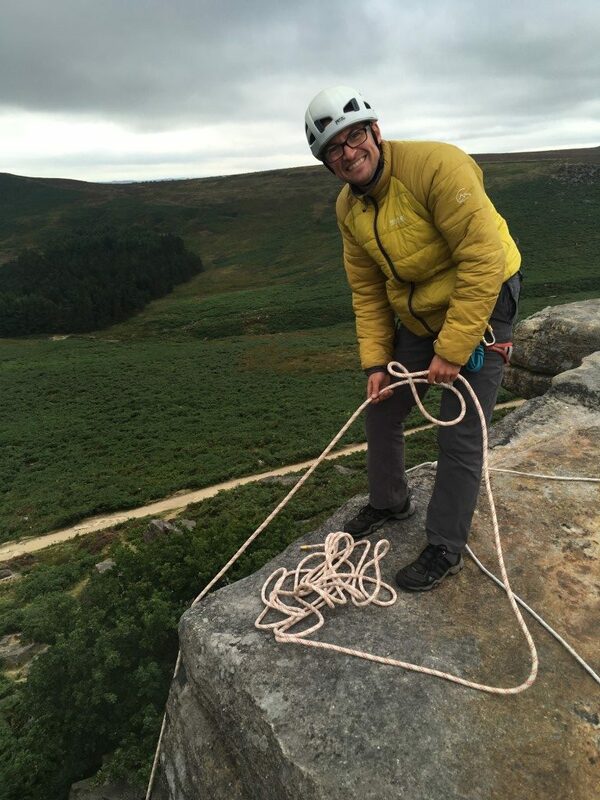 We started learning the harnesses and how to tie in safely followed by the basics of belaying. 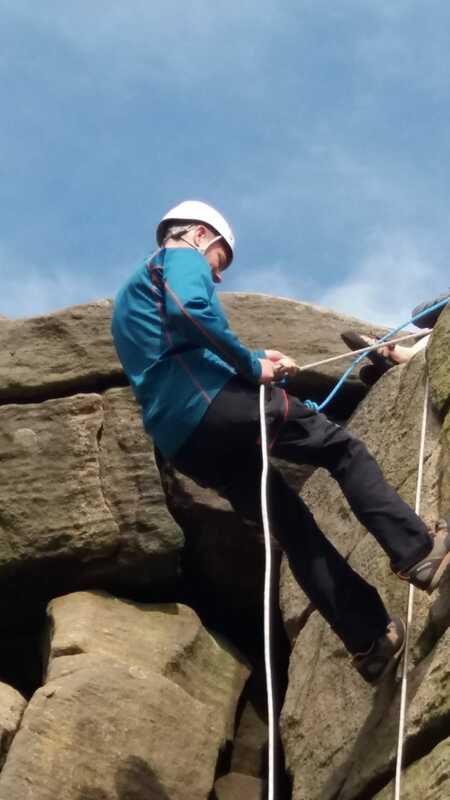 Then we started climbing up the crags and putting our theory into practise. The sun was shining and everyone was having a great time and we were all starting to climb higher up and over more difficult routes. 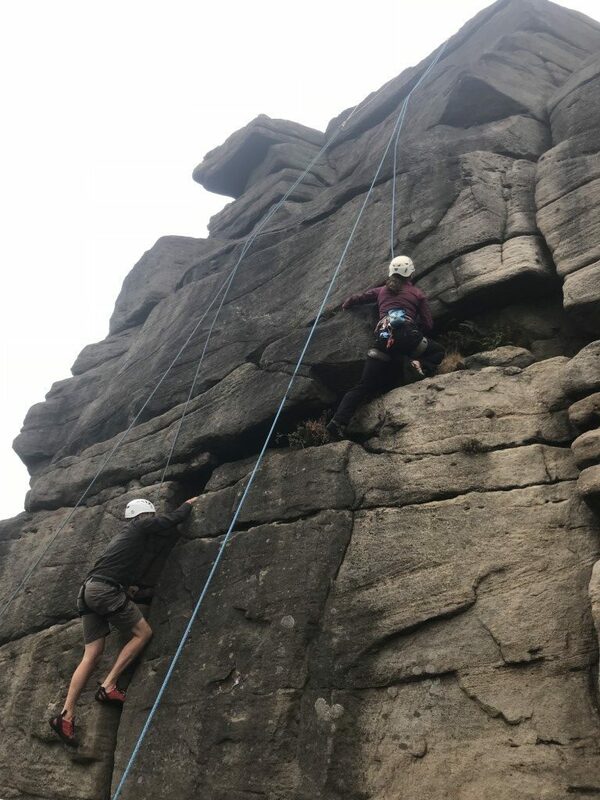 After lunch we practised some abseiling by belaying ourselves down with Anita looking after an additional safety rope just in case. 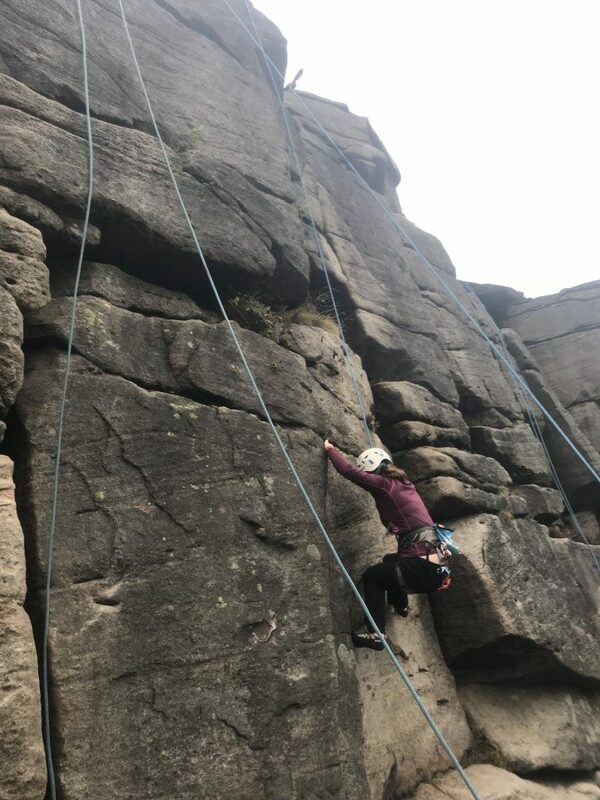 Trudy ended upside down at one point as she leaned back a bit too far but she soon righted herself and continued abseiling down the wall. 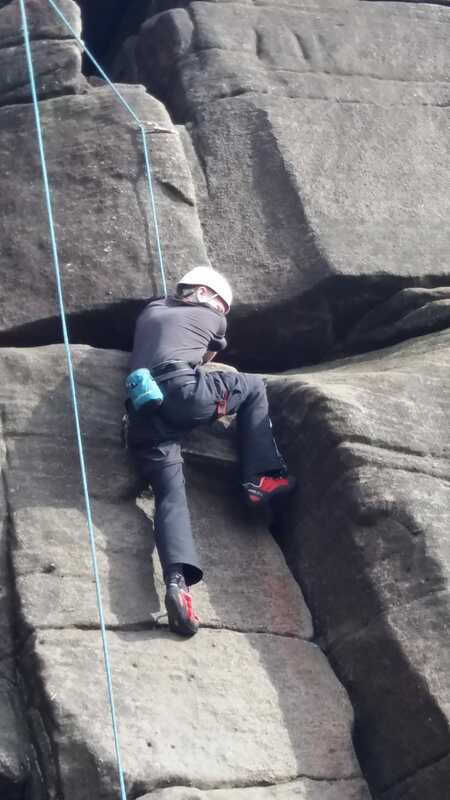 Then Danny setup some more difficult routes with some overhanging rocks to test us. 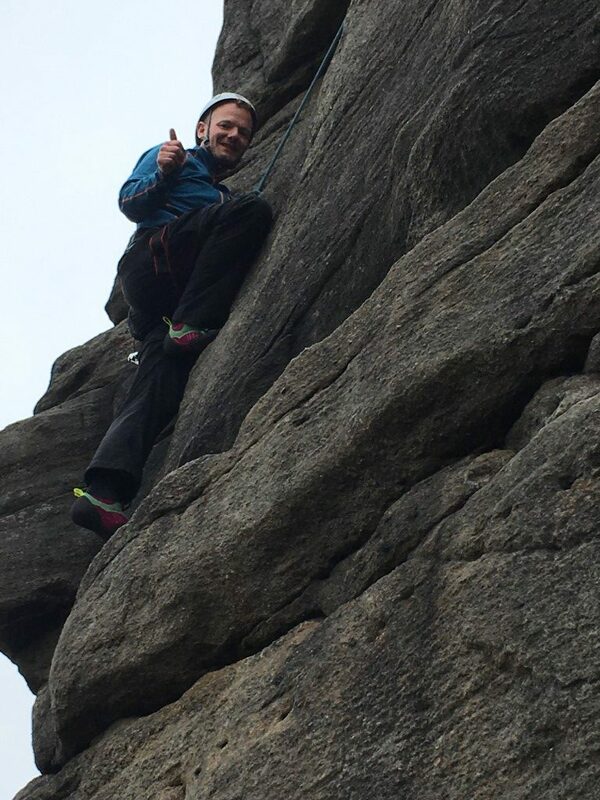 Martin did a great job of getting up over them but he was the only one. 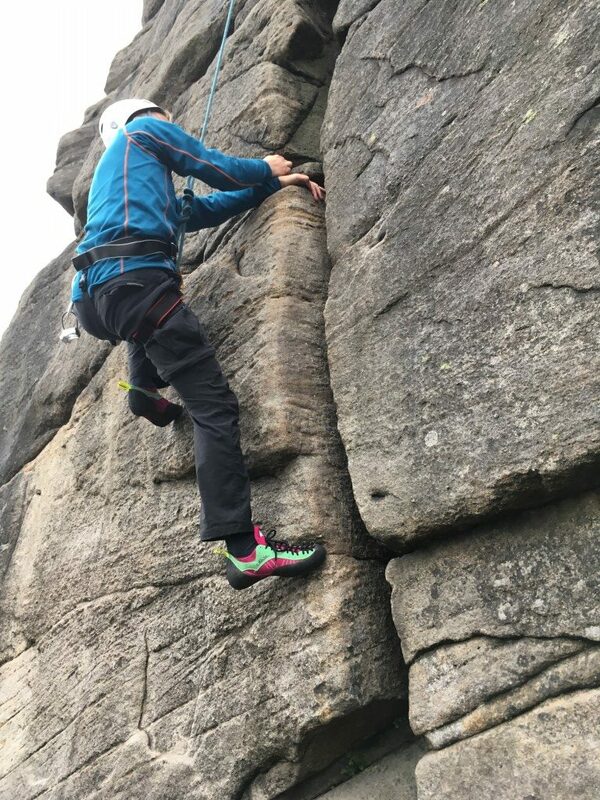 Danny then showed us how it should be done and made it look easy. 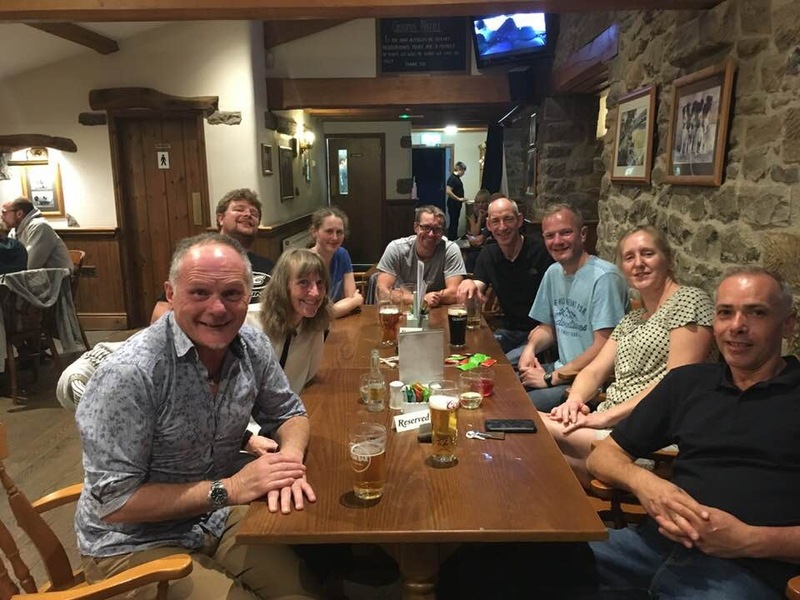 After a full-on day we retired to the pub for an evening meal all suitably achy but happy after a great day. 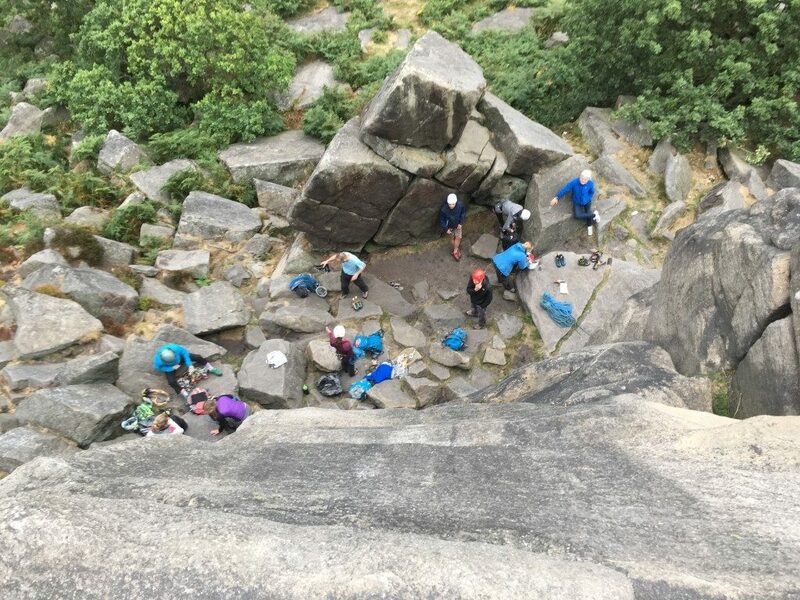 Sunday morning started a bit rainy so we had a slower start to the day. 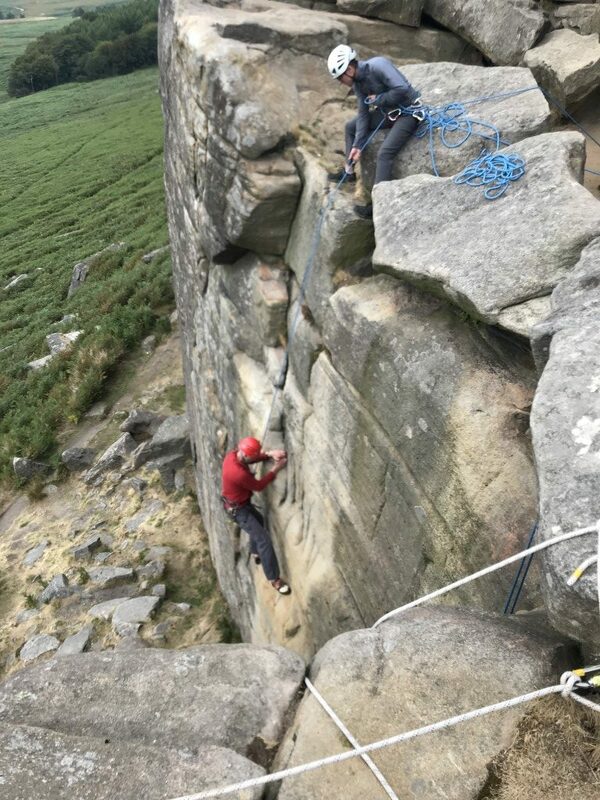 We drove over Burbage just a few miles on from Stanage where Danny knew a great rock wall about 15m in height sheltered from the breeze. 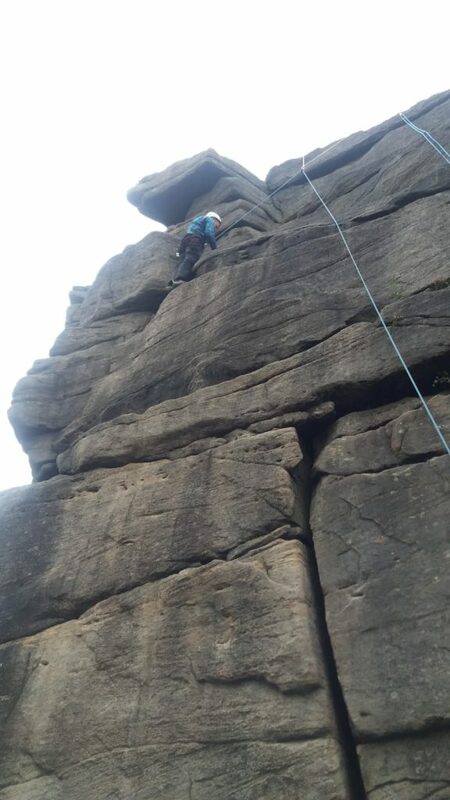 The day was a bit cooler but the rocks soon dried out by late morning and so we were all set to go again. 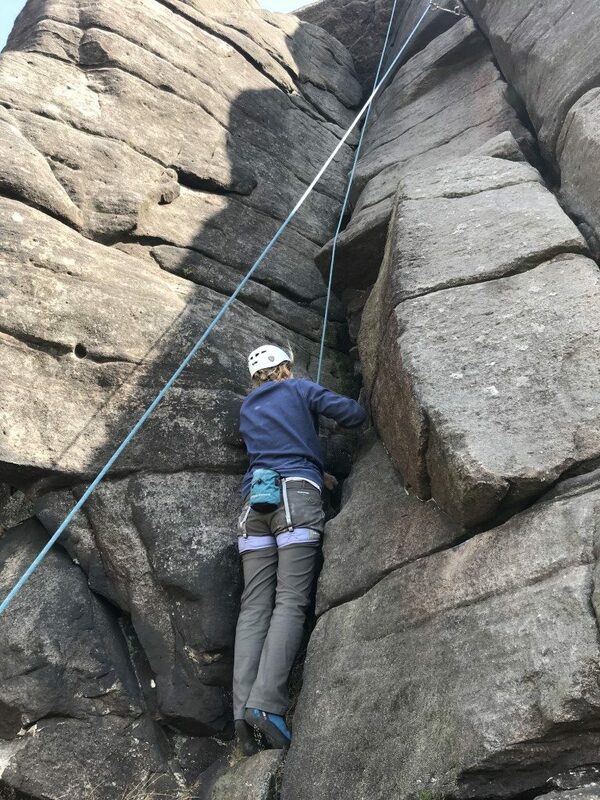 Anita then talked us through some of the other equipment that we use such as Karabinas, Hexes, Wallnuts, Peenuts, Quickdraws etc and how they are all used and secured. 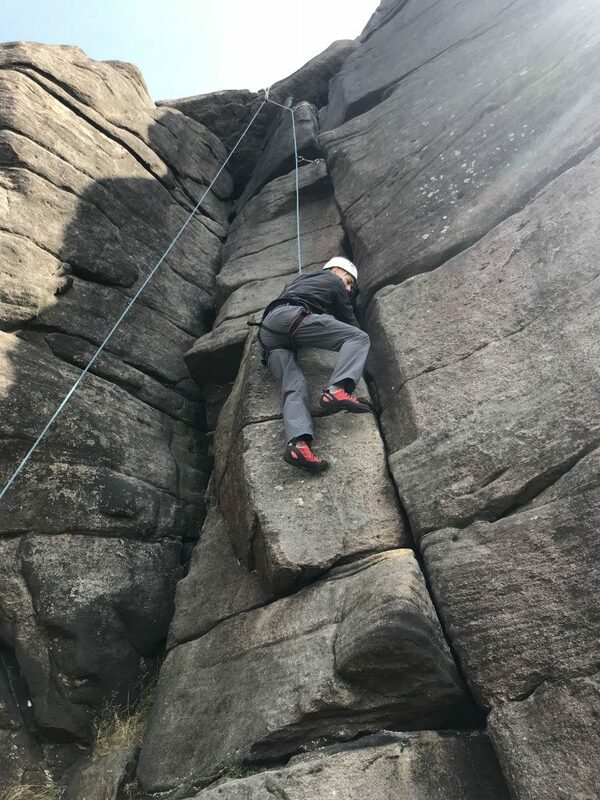 Once we had warmed up we carried on practising our climbing skills. 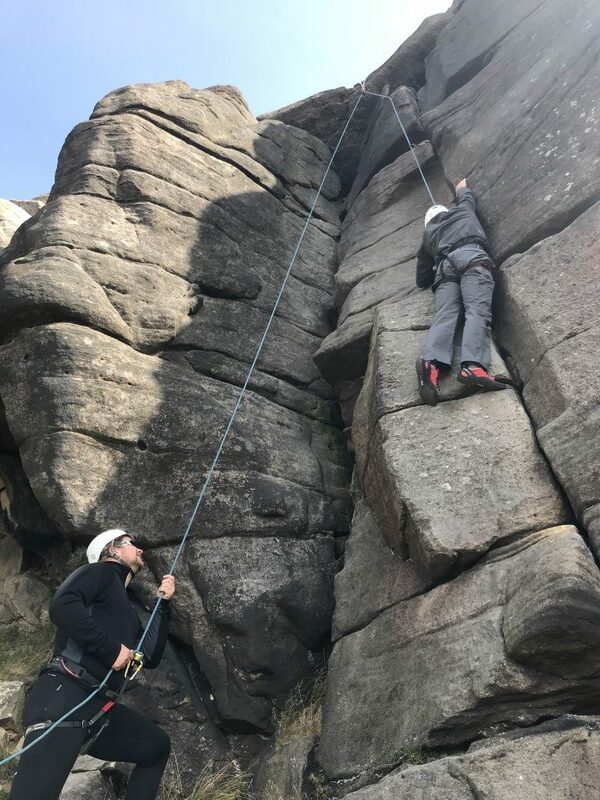 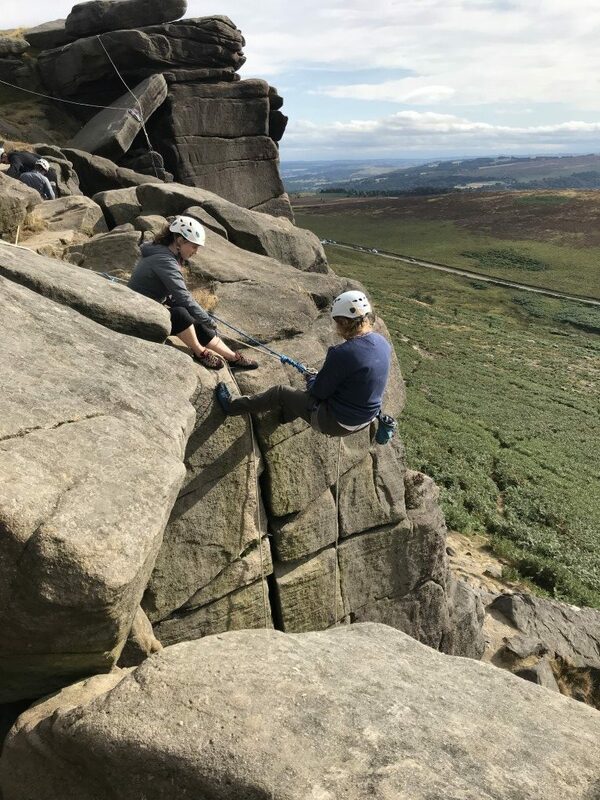 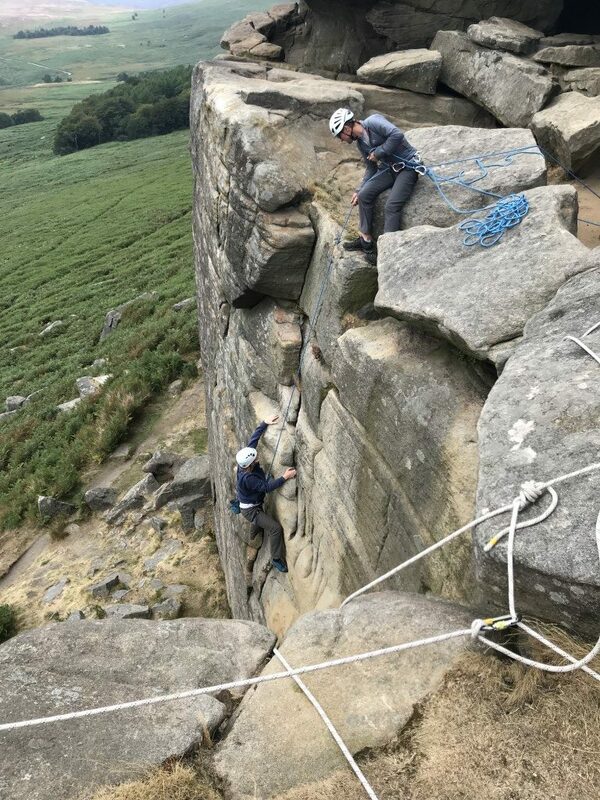 Andy and Martin did a good job of using the rocks and hand holds learning to hanging off the rocks to position themselves at different angles to reach new footholds. 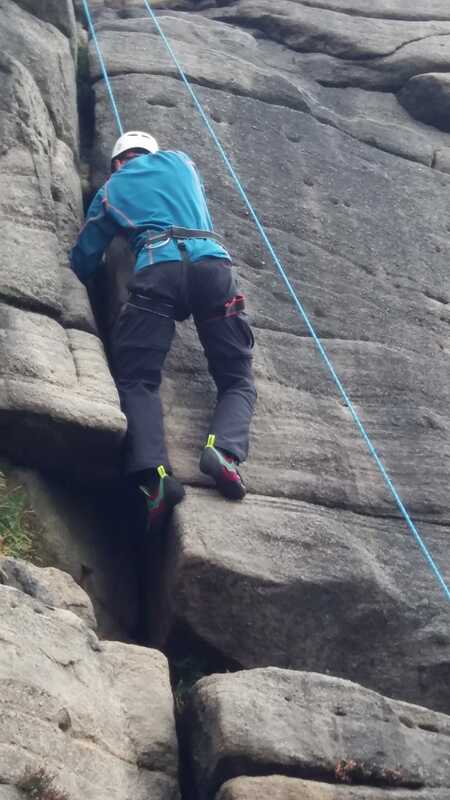 Also using cracks to put your arm in to use as an anchor was a good experience. 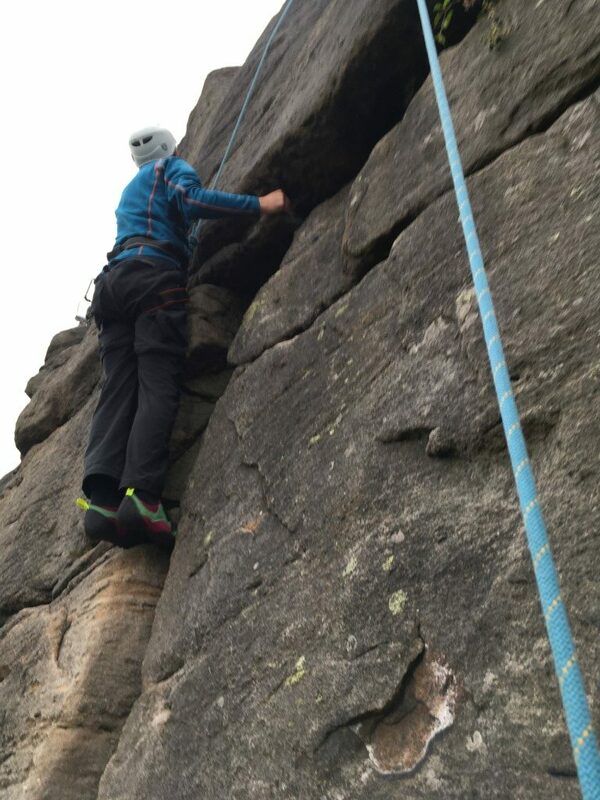 Sue did well pushing herself up to the top of the wall and well outside of her comfort zone. 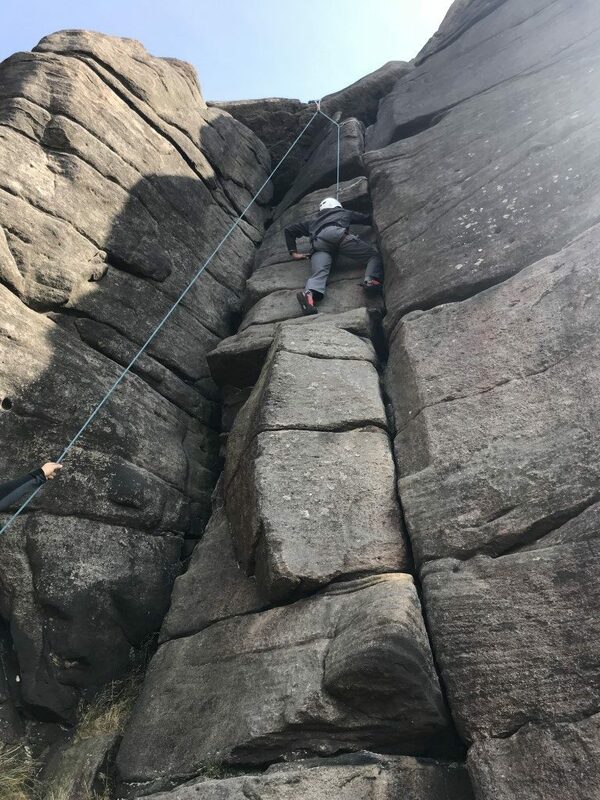 As the day drew to a close tiredness set in and there was just one last chance for Andy to climb the hardest route of the weekend which he just managed to do at the final attempt before running out of puff.